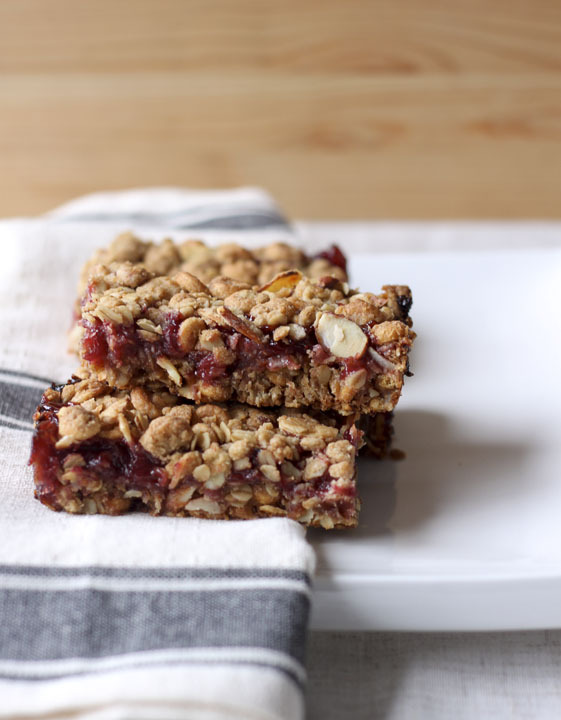 Almond Lingonberry Cereal Bars — always with butter. Finally, a cereal bar recipe that really does taste like a cereal bar. At first, I though this recipe would kind of be a throw-away recipe, probably not worth blogging about because they were just using what was in my cupboard. But to my delightful surprise, these babies are perfect for breakfast on the run. They keep their shape and do not just crumble right when you grab them as I expected them too. Keep them in the fridge, they will hold up better and taste better. I think the cinnamon cherrios are a new concoction for the brand, so use honey nut or plain if you don't have them. The cinnamon ones just give a nice flavor with the lingonberry. Oven 350F. Butter a 9inch square baking pan. Mix flour, oats, cherrios, pecans, cinnamon, baking powder and salt in a bowl. Set aside. Beat butter, oil, sugar and vanilla. Add in the dry ingredients and mx until a crumbly dough forms. Reserve 1 1/2 cups aside for topping. Press remaining into the bottom of the pan. Spread jam evenly over dough. Crumble up and sprinkle the rest of the dough over top. Gently press down so it will adhere to fruit layer. Bake for 30 minutes until a deep golden brown. Cool for 15 minutes in pan then slice and let cool completely.